Yes... this small room is getting it's SECOND reveal. lol. I have been working hard on decorating this tiny little room, and STILL have about 4 more things I need to get or do, but I just LOVE how things are turning out... So I thought I'd share! The lighting in this space is well.... there is NONE... lol, so these pictures aren't the best, but you'll get the idea. DO you LOVE the cute little chandelier that only cost me $4 at the DI!? Woot woot! It's amazing what a little spray paint and a home made cord cover can do!!! My MIL got me the cute green wreath, and the blue tin and jars, for Christmas, and I just printed out a vinyl label, got a silver scoop for my oxyclean, and a cute dark brown basket for my dryer sheets from Michaels, with my 40% off coupon. This is the door that we use all the time (the garage door) so I wanted to put something there that we would see everyday. I forgot to take a before picture of this tin. But it was dark brown and used to be in my bathroom upstairs. I knew I wanted one that was white... so ta-da... a little white spray paint, and it looks new! And this photo frame I got at my thrift store for $.50 cents! I love it! It' starting to feel LESS like a laundry room everyday. ha! I actually LIKE being in this space now! Mostly to look at all the fun stuff... and THEN to do laundry. (blahhhk) lol. Of course it looks awesome Shelley!!! You have no idea how exciting this post was to me b/c as you know I'm finishing up our laundry room and the only thing is the light...I had NO idea what to do in there b/c of the no light thing. The chandelier is PERFECT!!! not to mention A.DOR.ABLE!!! Okay so I just have to say...I am absolutely in love with everything about your Laundry room! That would totally get me back in the laundry vibe if I had something that cute to look at when I threw in a load! I do have a question for you though. I read your keeping your house clean post...I even took it all to heart. I'm soooo working on cleaning and oraganizing my (stinkin' apartment that I can't stand that's super expensive and am dying to finally get another home of our own!) anyway so I'm trying to get it under control. But what do your girls do while you work? Are they just old enough to hang out and play together. Because everytime I start a project Sadie is attached to my hip trying to help! You AMAZE me! Any suggestions? Darling Shelley!!! You are so gifted. I just love your style girl. That is so pretty ... and with a chandelier! Heavens!! What an awesome room to do laundry in! If mine looked like that I might actually enjoy it! looks wonderful...I wouldn't mind doing some laundry in that room!! VERY Cute! I assume since you said you went to DI that you are in UT? Have you checked Ikea for a rug? They always have cute ones, and not too expensive either! It looks so great, and I love how cheap it was to do!! We're in the process of remodeling our nasty little laundry room and I can't wait to add touches just like the ones you used. LOVE IT! Bet you feel inspired to do laundry! AMAZING!!!!! I LOVEEEE oyur Laundry room transforamation.... You did a great job!!!! I find that rugs come out in droves around back to school time...you know for all of the college students...you might have some luck then...just a thought. Beautiful! I love the way you have decorated it! My "laundry room" has been a thorn in my side since we moved in to our house. Thanks for the inspiration! Oh, it is SO pretty!! it looks very nice! 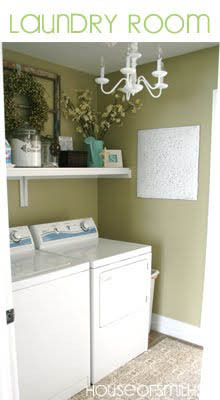 I've seen alot of other blogs who "pimp" their laundry rooms by placing a small table to fit in between the washer/dryer and just add some cloth on the bottom part to hide trash cans etc. Just luurrvvv it! A suggestion for the laundry detergent, what about an old style ice tea or lemonade dispenser, the glass ones in a stand with a spout in the front. This is absolutely gorgeous. I love every little touch u added and SCORE for ur amazing finds! Nice....wished I had an actual washroom and not a wash closet. I'm a new reader to your blog, found you through Jen on your rose ball tutorial (cute!). :) Great laundry room! For your liquid soap, would one of those glass drink things works? "Things"...LOL. You know, you put lemonade in them and they have a little spigot on them. You can find them at hobby lobby for about $40, or at Costco for $20. Either one of those, or the idea of a box-like cover with an open bottom to just slide over the top of the jug that the soap comes in already would work. P.S. I plan on using a big jar for my laundry detergent, but that means I will need to stick with powder and not buy liquid. I suggest doing that as a cute way to dispense your soap. I cant think of anything cute for that plastic container..sorry. Hi there! May I ask where you purchased your silver scoop for the laundry detergent? I have a glass jar that my detergent is in as well and have been looking for a scoop for a while! Your laundry room is cuter than any room in my house. How do you do it. So darling!!! Anyway, nice to meet you! LOVE your paper roses too. They are beautiful! So pretty! Makes me want to get up and clean and decorate my laundry room! This looks great! I love the window with the wreath on it and I love the display you set up on the shelf. We spend so much time in and out of this room, it should look pretty! This turned out so great! I love it. I'm featuring a necklace tutorial and giveaway. I'd love it if you stopped by my blog! Sooo beautiful! It looks like a model home! Shelley I'd come fold your laundry any time! Such a pretty area for the most mundane of household tasks. What is DI? I keep seeing this mystery place mentioned but can't figure it out? I didn't read through all the comments to see if someone suggested this, but... Have you thought about putting the liquid soap in one of those cute cooler type things that people use for outside parties?? Does that make any sort of sense?? I have. It leaks :( Doesn't work so well... dang it! I'm looking into a milking can type thing though! Seriously, having a chandelier in the laundry room has to make laundry just THAT much more bearable! Love it! Uh I love this room! My laundry room also is the exit to the garage but we have cabinets above our washer and dryer and I only have about a foot of space in between not to mention the room is tiny to begin with I want to decorate it so badly! Your laundry room looks so wonderful! I will be linkng up to your beautiful laundry room. Thanks for sharing. Crazy! I just painted my laundry room green (leftover paint from my office) then my Tall Man put up a shelf. A friend of mine offered me a large window she doesn't know what to do with, so I was thinking about propping it on the shelf in my laundry room. Here I thought I was creative, looks like I had a little inspiration. =o) You're awesome! how did you print a decorative vinyl label? I really like that idea of a glass jar. Hi - I'm also here to find out about your vinyl label. I love it! Thanks for sharing your laundry room - very inspiring. LOVE IT! I featured this today on my Loads of Fun laundry post! Hope you don't mind! First off, I have to say, I LOVE YOUR LAUNDRY ROOM!! My hubby doesn't seem to understand my need to make the laundry room pretty. . . grr! Secondly, I stumbled upon your website (I am now I follower - you have such great style) & was THRILLED to see that your hubby's name is CASON. We named our son that almost a year ago & I am so totally in love with the name. Alot of people think I am saying Jason when I tell them his name & then I get "the look" when I spell it for them. I could not love the name anymore than I do & I am so happy to hear that there is another one out there!! I love this!! I have recently taken on the project of making my laundry room an actual room I want to spend time in!!! It's just wide enough for a regular washer and dryer, so I am limited on space but so far looks great!! For my liquid fabric softner, I am using a clear decanter from Walmart for $5 and liquid detergent oone of those clear drink dispensers that I got from Sam's Club for $19.99!!! I'm sure you've already solved the issue by now, but have you thought about a glass jar with one of the little spouts on the front? thank you so much for sharing! we dont have a home [yet] here in San Diego.. butfelt inspired to "remodel" our kitchen/ laundryroom/dinningroom.... yes they are ALL in one room that you see when you walk through the front door! youinspired me to drive [a long way] to the only DI here in SD and i have so many great finds! we have a ton of thrift stores but felt DI was worth the trip today :) anyhow.. thanks for being inspiring, even for us folks still stuck in an apartment! I absolutely LOVE your blog! Your house is my dream. I just linked your blog to mine to show off your awesome laundry room. I am super new to blogging and have not figured out the whole "button" thing yet. How do I put your button on my blog? Thank you for your inspiration! I love it. That is exactly what my laundry room looks like, well the size and the placement of the washer and dryer and shelf. I am going to have to do this. Your laundry room makeover is fabulous. I really could be happy doing laundry in that room. I need to go work on mine now. The room, and the laundry! Very beautiful laundry room. It seems that young moms spend alot of time in there and alone, so lets step it up a notch or two. Gorgeous. Loving all of your things. What color did you use on the walls here?